The time has come to bid farewell to an old friend. After 56 seasons, more than 1,000 games, and countless memories, Starr Rink served as home of Colgate hockey for one last weekend at the end of February. Women’s ice hockey had the last game in the rink, beating Harvard with a thrilling overtime victory (3–2) in the ECAC Hockey quarterfinals. At press time, the team was advancing to the ECAC tournament semifinals for the second time in program history. They’d also broken their all-time win record (22 and counting). The men’s team also reigned victorious in its last two games in Starr Rink, beating RPI (2–0) and Union (2–1). At press time, the team was heading into the ECAC tournament. In addition, that weekend the men’s hockey program and the Silver Puck Club honored Murray Decock ’80 with the Silver Puck Award. Decock has been closely associated with men’s ice hockey for nearly 40 years, ever since his arrival on campus as a first-year in the fall of 1976. A four-year member of the program, Decock appeared in 115 games for the Raiders, compiling 91 points on 40 goals and 51 assists. His best season came during his junior campaign of 1978–79 when he tallied 33 points (16g, 17a) in 28 games. Decock went on to become instrumental as a Colgate professional in engaging alumni and parents to support institutional priorities, including the planning and construction of the the Class of 1965 Arena. After serving as vice president for institutional advancement from 2002–2015, he was promoted to senior vice president for external relations, advancement, and initiatives in July. Starr Rink’s successor, the Class of 1965 Arena, will formally open its doors in October, for the start of the 2016–17 season. 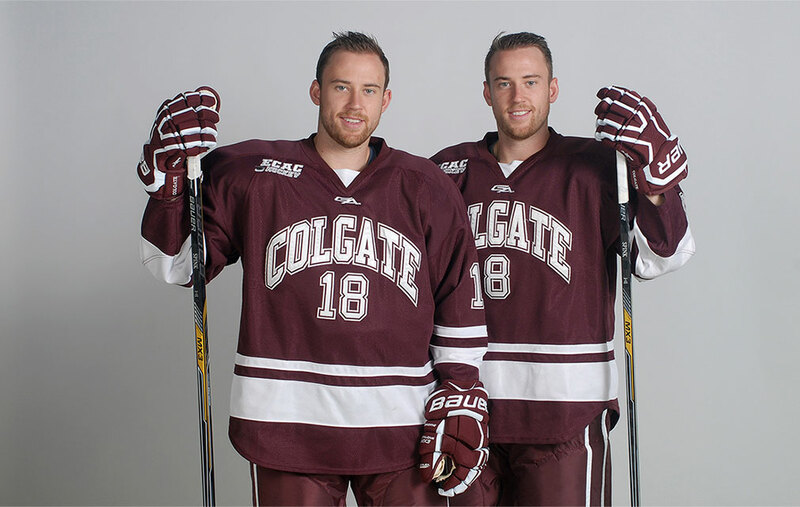 A longer version of this article, originally titled “Canada’s Spink twins ruling NCAA ice for the Colgate University Raiders” (by David Shoalts), was first published in the Globe and Mail (Toronto). At press time, fans were still voting for the Hobey Baker Award winner. For all of their 23 years, Tyson ’16 and Tylor ’16 Spink have been a package deal. So you can’t blame them for thinking perhaps that should apply to the Hobey Baker Award as well. The identical twin brothers from the small Eastern Ontario [Canada] town of Williamstown rank one-two in points for the Raiders. Tyson is the leader with 37 points in 37 games, three better than his linemate Tylor, and it was his name that was included in the first round of 66 nominees for the Hobey Baker, which goes to the season’s best NCAA men’s player. The Spink brothers have been on the same line since they began playing organized hockey when they were 4. There was only one brief stretch when they were separated. Nineteen years later, neither player needs to look where the other one is on the ice — they just know. “There was one year in peewee when our coaches split us up for half a year,” Tylor, the more talkative of the pair, said. “It was kind of a rough year for the team and I think the coaches wanted to change things up. It didn’t do any good. Our success comes from being familiar with playing with one another. It’s our advantage.” The brothers also study together. They are both education majors. The only big difference between them is that Tyson, a center, shoots left while Tylor is a right-hand shot on the right wing. “Mirror-image twins,” Tyson once told an interviewer. The brothers went into junior hockey together, playing for four seasons in Junior A with the Cornwall Colts of the Central Canada Hockey League before landing in 2012 at Colgate. 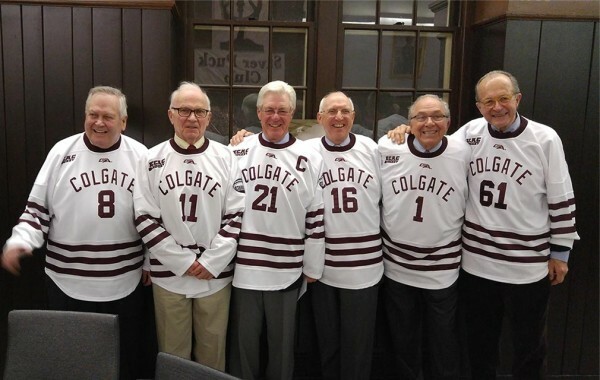 It was their friendship with Colorado Avalanche player Jesse Winchester ’08, who also grew up in the Cornwall area, that brought them to Colgate. The Spinks met Winchester, who started his NHL career with the Ottawa Senators, about 10 years ago, when they all worked with the same fitness trainer in Cornwall. Winchester spent a lot of time talking up his school. The Hobey Baker nomination is the first major individual recognition Tyson has received. Both he and Tylor are considered undersized for the NHL at 5 foot 10 and 185 pounds each and neither was drafted when they became eligible. They are both still hoping to play professionally, and when the NCAA season is over, they will be free agents. They attended the Detroit Red Wings development camp in 2014 and have drawn some interest from other NHL teams. 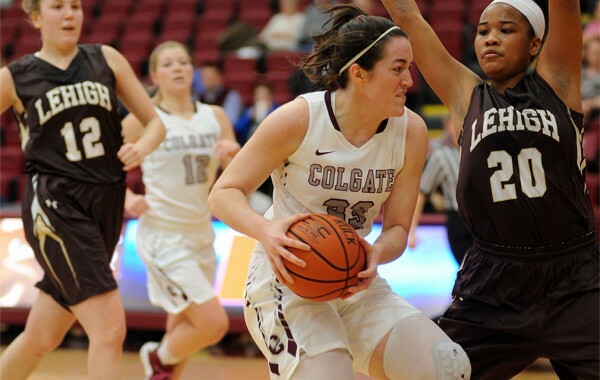 Colgate placed an even 100 student-athletes from seven sports on the 2015 Patriot League Fall Academic Honor Roll for strong performances in the classroom — more than a 17 percent increase over the fall 2014 total, and more than 40 percent above 2013’s. Football led the way (23 recipients), followed closely by women’s soccer (20), men’s soccer (14), and field hockey (13). 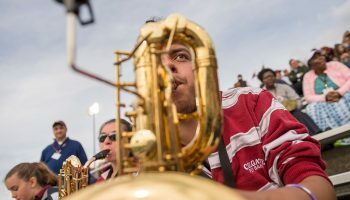 To be eligible for the Academic Honor Roll, a student-athlete must earn a 3.20 grade point average in the fall semester and participate in one of the Patriot League’s seven fall championship sports. For Austin Tillotson ’16 and the rest of the men’s basketball team, Senior Day had a storybook ending that even many in the crowd couldn’t believe. For those who weren’t there on February 21, luckily, there is video. It was a critical Patriot League game, and Loyola’s Andre Walker had tied the score at 90–90 by hitting a contested 3-pointer with 2.9 seconds left in overtime. 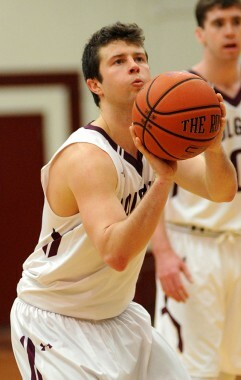 When Tillotson received the ensuing inbound pass, he took two dribbles and heaved the ball from half-court. Nothing but net. The winning play garnered national publicity, beating out the best finish in Daytona 500 history as the No. 1 play on ESPN SportsCenter’s Top 10 and going viral online. This was Colgate’s second Sports Center Top 10 play this season. On December 5, tight end John Quazza ’16 made an unbelievable touchdown catch in the NCAA Division I Football playoffs against No. 5-seeded James Madison. 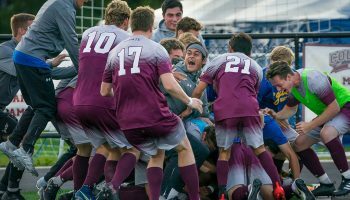 After its second-best postseason run in history last fall, Colgate football landed inside the final top 20 in both major national polls. The 2015 FCS Coaches Poll boosted Colgate to 13th, and the STATS FCS Poll put the Raiders 17th. “This team showed it can play at a very high level, and we beat some very good teams during our run at the end,” Head Coach Dan Hunt said. 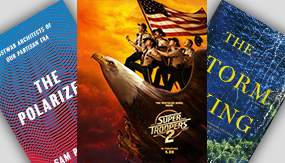 It was a remarkable year for the team. Patriot League championship. Perfect league record. Six conference wins for the first time in 12 years. NCAA playoff berth. 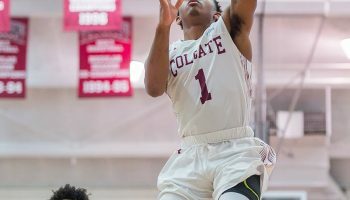 Two road playoff victories for just the second time in Colgate and Patriot League history. Nine overall wins for just the ninth time in program history. “You returned Colgate football to national prominence,” Hunt told the team. Hunt was named Patriot League and ECAC Coach of the Year, and 12 Raiders were named to either the All-Patriot League first or second teams.